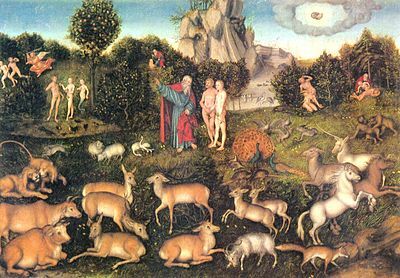 Paradise by Lucas Cranach. A representation of peace and love between all creatures. Tolerance between religions and all people is requirement to create a world of peace, love and happiness. Inter-religious dialog is important to achieve a better world. Even theists and atheists should find a way of understanding. This is possible on the basis of scientific clarification of the question of God. In history we often find that war and hate is rooted in religions disputes. Our future can only exist by promoting the goal of peaceful cooperation. Killing each other has to be repudiated and for this strengthening the peaceful tendencies of religions will be a factor. Toleration of thoughts from other people is part of the essence of true democracy. Only if freedom of expression exists, it is then possible to discuss the best way for all. True democracy is, so far, the best path for reaching a society more averse to war and killing each other. The first goal of toleration is to avoid hate in a society. The second goal is promoting constructive discussion, especially between divergent views, like religions. The third goal is that all work together for a world of love, peace and happiness. To create a global dialog of faiths is the goal of the Parliament of the World's Religions.